Granderson would lead the game off continuing his strange season by hitting a homerun, high off of the right field wall. Curtis would give the Mets the 1-0 lead over the Marlins. Gsellman, who’s having just about a strange season as Granderson is, has been having a shaky past few starts. After giving up a couple of hits in the first with Marlins on second & third, Gsellman would give up a two run single to the Miami first baseman Justin Bour, giving the Marlins the 2-1 lead. Martin Prado followed with an RBI double down the left field line to bring in Miami’s third run before Gsellman struck out catcher Realmuto to put an end to the inning. Gsellman picked up the Mets second hit of the evening in the top of the second with a one out line drive single, struck straight up the middle. Asdrubal Cabrera then hit a two out double following a Granderson strike out to put runners on second & third for Cespedes with two down. Straily would throw 2 straight sliders to get Cespedes to chase, putting him in the early hole. He then threw an 0-2 fastball on the outside black to strike Cespedes out looking, stranding the tying run on second base. Gsellman started the third out by striking Stanton out but then gave up a double to Marlins center fielder Christian Yelich. Gsellman then struck out the talented outfielder Marcell Ozuna & was able to get Justin Boar to fly out to Cespedes in left. Duda smoked a one out double into the shift in the fourth to put a runner in scoring position. Reyes then walked to put runners on the corners for Mets catcher Travis d’Arnaud. d’Arnaud would pick up his 25th RBI of the year as he singled the first pitch up the middle. Gsellman then tapped a bouncer where Dee Gordon made a great scoop & shoveling play at first base to put an end to the inning & the Mets run. However, Gsellman would also have to leave the game on that play due to a leg injury. By the looks of it on T.V., he possibly pulled or strained his left hamstring or quadricep. Paul Sewald would come in as his replacement. Travis d’Arnaud would lead the seventh off in a big way. He would hit a solo homerun to tie the game for the Mets against the Marlins hard throwing Kyle Barraclough. After picking up Gsellman after the leg injury, Sewald was lifted from the game after three innings & was replaced by Mets righty Neil Ramirez. He would walk Realmuto to lead off the bottom half of the seventh, then rookie J.T. Riddle would hit a hard ground ball to Duda at first in which Duda booted off of the heel of his glove to put Marlins on first & second for the newly entered Jerry Blevins. Pinch hitter Ichiro Suzuki would slap a single in the the opposite side hole to give the “Fish” the 4-3 lead with Dee Gordon at the plate & runners on first & second. Gordon would hit a soft grounder to second baseman Asdrubal Cabrera, who opted to go to first for the out, the Mets then intentionally walked Stanton to load the bases for Christian Yelich. Yelich would then get a base hit to drive in two more runs to give the Marlins some insurance with the the three run lead. Collins then walked out to the mound to pull Blevins in favor of Goedell. Goedell got Ozuna to foul out to Jay Bruce, who made a good play getting to the ball for the second out. Bour then followed with a line drive smoked out to right field but Bruce would make the catch while barely having to drift back a few steps to put an end to the bleeding for the Mets. David Phelps would come into the game in the eighth & give up a one out walk to Jay Bruce. Phelps next struck out Lucas Duda before getting Wilmer Flores to fly out to right fielder Giancarlo Stanton to end the top part of the eighth. Goedell continued to pitch the eighth where he showed signs of being a future cog in the Mets machine by getting five outs & saving another arm in pen. Reyes started the ninth inning off with a bullet to right as A.J. Ramos tries to pick up his 13th save, however TdA followed by flying out to center on the first pitch of the at-bat. T.J. Rivera would come on & pinch hit with Reyes on second due to a wild pitch. Rivera would make Ramos work but Ramos would get the better of the two as Rivera would pop out to Dee Gordon. After another battle, this time with Curtis Granderson, the Marlins would pick up the third out & the 6-3 win putting an end to the Mets win streak coming out of San Francisco. Positives: Sewald & Goedell were both sharp out of the bullpen, each going more than an inning & showing their potential to be apart of the team in the future instead of claiming the Neil Ramirez’ of the world off of waivers only to regret it. Negatives: Injuries. 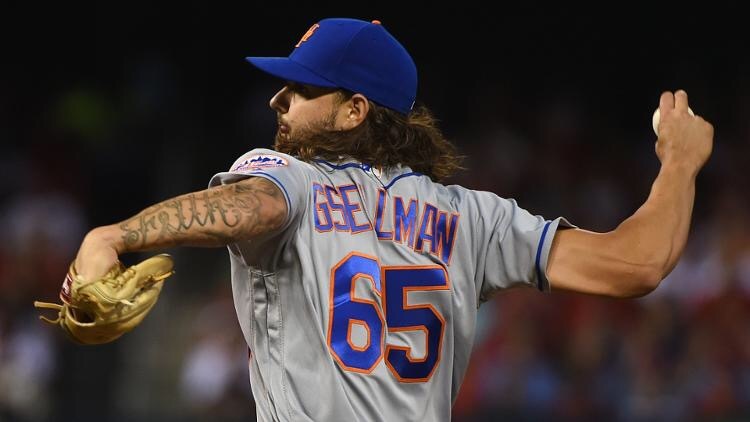 I know nothing about the medical world but my guess is that Gsellman will be the next Met to join a few teammates on the DL. Wilmer Flores also showed some shotty decision making in the field a couple of times to make you wonder if he’s fit for the position or better off on the bench with everything going on with Asdrubal Cabrera.